It's so true when they say 'you don't appreciate what you've got till it's gone'. For me, that was bouncy springy skin. I see it in my daughters now. Jealous? Not much. As the years go by, our skin invariably degenerates and there’s little that can be done to slow it down. Or is there? Creams can only do so much, but they can't reverse the inevitable loss of collagen which results in saggy skin. I remember reading a few years ago about collagen supplements and didn’t really believe it could have any benefit for the skin. But after researching various brands, I decided to find out whether there is anything in what they say. The most recent brand I have been consuming is called LQ Liquid Health marine collagen which was sent to me to try out over a 30 day period. 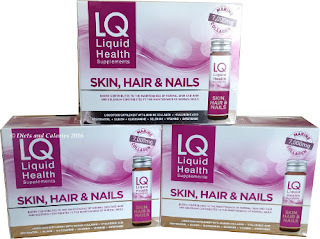 LQ Liquid Health Supplements are aimed at supporting skin, hair and nail health. Each box contains 10 x 50ml bottles and you should drink one bottle per day. Forever! Collagen is a major protein that supports firm, youthful skin. Apparently, after 30, we lose 1.5% Collagen a year. This results in saggy skin that no cream can cure. As well as waging war on wrinkles and delivering a super-boost of anti-ageing protection for skin, its scientific formula promotes healthy hair and stronger nails too. Here I was, faced with 30 bottles of LQ Liquid Health to drink. Besides hoping it would have some noticeable effects on my skin, I also hoped that tastewise it would be easy to drink. The ingredients include passion fruit concentrate juice and exotic fruit natural flavouring, so it sounded good to me. I decided to drink my liquid collagen each evening before my main meal. I’d read somewhere that taking collagen is better in the evening as it can have a chance to do its repairing while you’re sleeping. 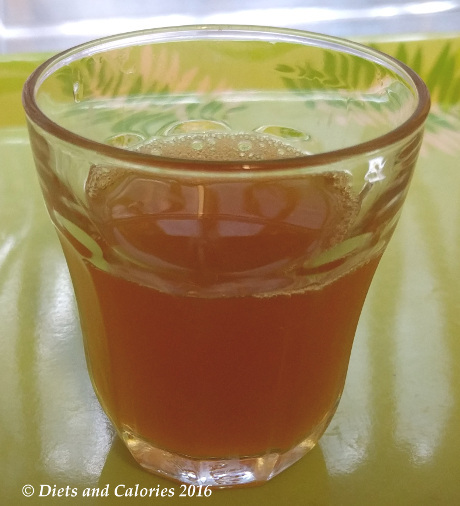 The liquid has a slight syrupy consistency and isn’t overly sweet. At first I quite liked it and thought this would be very easy to get used to. However, by the end of the month, I have to admit, I wasn’t looking forward to the taste any more. It was starting to make me feel a bit sick (not physically) just the taste. I know that 30 days isn’t enough time to see any real benefits, as skin turnover etc isn’t that fast. However, what I did notice was my nails. They suddenly started growing faster. For the first time in years I was able to grow fingernails long enough for them to be worthy of nail polish! I can’t honestly report any difference to my skin, but then I already take various supplements and eat a very healthy diet. But another area I found improved was my creaky knees. I used to play a lot of tennis and now have dodgy knees which are often painful on standing if I've been sitting down for a while. However, I can really notice a difference and the creaky knees have definitely improved. What it looks like outside the bottle! I love the ingredients in this supplement and in general, prefer taking my supplements in liquid form as they’re quicker and easier to absorb. However, the main thing that will put me off continuing with this supplement is, I’m afraid, the cost. I’d already tried the Pure Gold Collagen and the Gold Collagen Forte brand which also come in ready to drink bottles and they are expensive - £34.99 for 10 bottles. I did buy mine on special offer of buy 2 get one free. But still, it’s a lot. 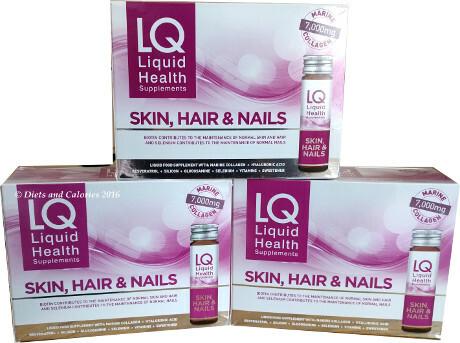 The LQ Liquid Supplements cost £29.99 for 10 bottles and contain higher amounts of collagen than the Gold Collagen Forte. They is a slight difference in overall ingredients but they share some of the same. The Gold Forte Collagen supplements contains up to 5,000mg of hydrolysed collagen compared with Marine collagen hydrolysate 7,000mg for LQ. Many people swear by this product for improving their skin condition, but I can’t say I noticed a difference. Perhaps it’s too soon? You can find LQ Liquid Health supplements in branches of Boots. (Collagen is the most abundant, naturally occurring protein in the human body. Clinical studies have shown that a daily intake of 7000mg has a positive effect on skin, hair and nails). (Resveratrol: a wrinkle busting ingredient found in red grapes. Packed with natural antioxidants to fight free radicals and slow down skin ageing). 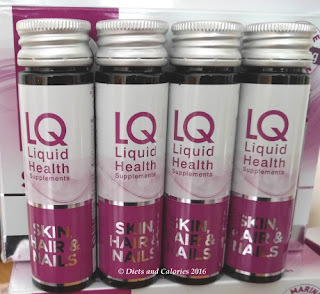 Disclaimer: I received 30 bottles of LQ Liquid Health in return for my honest review.